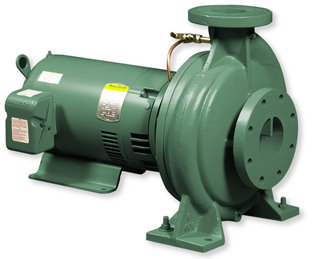 Taco CI Series Pumps provide the ultimate in reliability and ease of installation for heating, air conditioning, pressure boosting, cooling water transfer, and water supply applications. An easy-to-replace, slip-on shaft sleeve facilitates seal maintenance in the field and lowers maintenance costs. Taco's exclusive dry shaft design protects the pump shaft by eliminating contact with the circulating fluid, so corrosion-resistant shaft materials are generally not required. CI Pumps also feature flush seal line taps, allowing the installation of a filter to protect the seal from non-condensable particles present in open systems. In addition, pressure tappings on suction and discharge connections are provided as a standard feature. Please note: Models CM, FE and FM base-mounted and close-coupled pumps are obsolete. Various documents for these products are available in our Historical Literature archives. Easy-To-Replace, Slip-On Shaft Sleeve Facilitates Seal Maintenance in the Field, Lowers Maintenance Costs. Exclusive Dry Shaft Design Eliminates Contact with Circulating Fluid to Protect Pump. Corrosion-Resistant Shaft Materials Generally Not Required. Flush Seal Line Taps Allow Installation of Filter to Protect Seal from Non-Condensable Particles in Open Systems. 1/4 " NPT Pressure Tappings on Suction and Discharge Connections. Rear Pullout Design Allows Servicing Without Disturbing System Piping. Optional Low-Cost Replaceable Wear Ring Protects Casing During Normal Operation.